Head, Heart, Hands, Health, and Holy Cow – This Program Changed My Life! I pledge my head to clearer thought, my heart to greater loyalty, my hands to larger service, and my health to better living, for my club, my community, my country and my world. When I was a kid in 4-H, I would recite that pledge during each club meeting, each flag-raising ceremony at 4-H camp and during other 4-H interactions throughout the year. To be honest, I never put much thought into what those words truly meant. The older I get (maybe wiser, too? ), the more I understand what Otis Hall, the state leader in Kansas, was meaning when he wrote the pledge that was adopted in 1927. I pledge my head to clearer thought. When I went through the 4-H Charting project in 2006, I learned so much more about myself and others in my Charting group than I could have ever imagined. I learned my fears – not just that I’m scared of heights but what I truly feared in life. Granted, the specifics of what I feared then and now have changed, but I learned to recognize those fears and how to hit them head-on and push through them. I learned to care for the others in my Charting group. Whether it was giving advice on how to handle a situation, learning to clear my head and overcome a fear of heights when we did our trust fall, or just generally taking a step back and thinking each and every situation through, the 4-H Charting program, and earning my 4-H Charting pin, was one of the most impactful times of my 4-H membership. I pledge my heart to greater loyalty. I thought I had always been a loyal person, but then I joined 4-H. I learned a great deal about loyalty through this program. 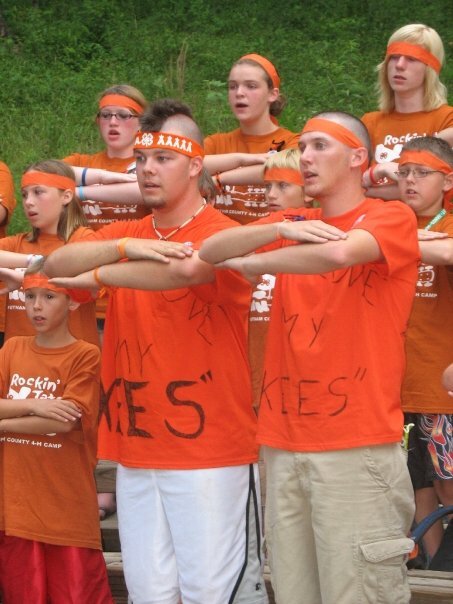 Whether it was loyalty toward my tribe at 4-H camp (How How, Cherokees! ), loyalty to my friends for a lifetime that I met through 4-H or just general loyalty to this youth development program, I truly learned what it meant to be loyal to something. Through 4-H, I learned that being loyal to something is more than just showing up to meetings every month or completing a 4-H project book. It was about opening up my heart to the message of 4-H and becoming a better person because of it. When you stand back and think of the four Hs, it takes all of them to become a well-rounded person. I won’t say that any one H is more important than the next, but, from my perspective, the Heart is where it all begins. I pledge my hands to larger service. I have always been engaged in community service, and perhaps this is why I am in Extension today, doing what I love. Having the opportunity to work directly in my community and in my county truly made an impact in my life. Whether it was making Halloween treat bags to take to kids in the local hospital, litter sweeps at 4-H camp and in my community, or doing fundraisers to help kids come to 4-H camp, they all gave me a perspective into community service. I pledge my health to better living. In the beginning of my time as a 4-Her, this H always seemed to be the outlier. It wasn’t until a few years in that I truly realized why this H was included. Without our health, we have nothing. 4-H was developed as a way to keep young people active and engaged in the community, state and country. For me, 4-H did just that. I’ve had the opportunity to exhibit market hogs at the county fair, where I won Senior Division Showmanship three years in a row; I’ve had some of my 4-H projects move on to the state fair for judging; and I’ve attended State 4-H camps. 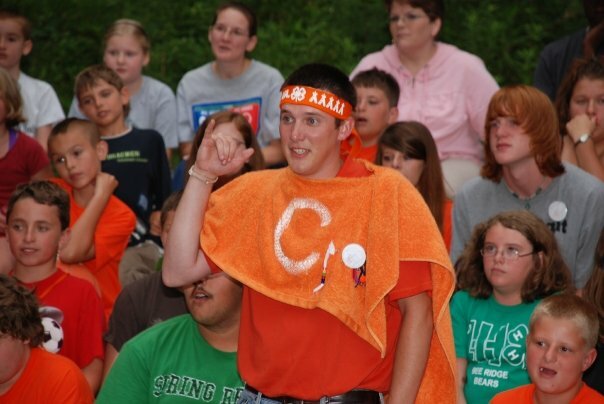 But my favorite week of the year was that annual county 4-H camp. It was the place where I made memories and friendships that will last a lifetime. Whether it was running around at the “field swim meet” after the pool was closed, dancing until my legs hurt to “Amos Moses” or just having a great time with great friends, it was always the healthiest week of my summer, from physical activity to friendship-building to mental health. To thank everyone who changed my life through 4-H would take the length of a novel, but to anyone who has ever crossed my path, from my first club meeting until I aged out of the program, or while I received my West Virginia 4-H All-Star pin, I say “Thank You!” It is because of you that I am who I am today. To sum up my experience in 4-H in just a few words would be very difficult, as this program has truly “Made the Best Better” and helped me become a True Leader. For my best attempt at summing up my 4-H experience into just two words, here goes: HOW HOW! Let’s show our 4-H’ers that their efforts are noticed, appreciated and impactful. Join us at 4-H as we continue to “Grow True Leaders”! Research shows that Students who meet regularly with their mentors are 52% less likely than their peers to skip a day of school and 37% less likely to skip a class. Seventy-six percent of at-risk young adults who had a mentor aspire to enroll in and graduate from college versus half of at-risk young adults who had no mentor. They are also more likely to be enrolled in college. Be open to sharing. Yes, you need to listen, but also be willing to share. Your ups and downs will help your mentee navigate their challenges. There is no perfectly smooth ride in anyone’s career. Be willing to share your mistakes and failures, those are great lessons for your mentee as well. Be Committed. If you are helping someone, you must be committed to doing so and to putting in the time to make the relationship work, for the long term. Have Integrity. You must be respected and respectable to be a good mentor. Be an honest person. It’s the way to be – even if you’re not a mentor! Be engaged. Hey, you can’t be a mentor just because it “sounds” like the right thing to do. Be present in the life of your mentee. This will be a personal relationship with give and take, a lot of listening and a lot of support. The mentor who helps me see what’s possible in my practice. The mentor who dares me into new work. The mentor who helps me fine-tune my instruction. The mentor who helps me find community. The mentor who helps me see what’s possible in my writing life. The mentor who helps me share my work publicly. The mentor who helps me stay balanced. These folks range from her principal, to a highly regarded author for English teachers to in-school colleagues, to her sister. That’s exactly how mentoring works in real life! Mentoring provides meaningful and necessary connections that impact the people involved in a great way. For those who are being mentored, the impact shows in academics, socially and economically. For those doing the mentoring it can build management skills and leadership skills, it can expand your professional network, and it also provides the great feeling of empowerment by giving back to the community. There are many ways to get involved and mentor in your community. Here at West Virginia State University Extension Service we are dedicated to the future of our communities. We have many mentoring opportunities from 4-H mentoring, STEM (Science, Technology, Engineering and Mathematics), agriculture, etc. If you are interested in being a volunteer for any of these programs, please contact WVSU Extension Service. But your options are not limited to just WVSU. Perform an online search for volunteer opportunities in your area and you will have an array of options like Americorps, Big Brothers Big Sisters, YWCA, and many, many more. At a time of great social need for our youth, why not be that person that will inspire change and teach life lessons that will help the youth succeed in life. Winter is a great time to teach your kids a little something about nature. These birdseed ornaments are a fun and easy kid-friendly activity that provides a great little snack for birds during the cold months of winter! Dissolve 2 small packets of Knox in 1/2 c. of hot water (we used water that had been heated in a coffee pot). Add 1 1/2 c. birdseed and mix until the seeds are coated. If you have a lot of excess liquid, add a little more seed. Bend pipe cleaner into a circle that fits inside the mold, leave the opposite end straight. Spoon coated birdseed into mold, filling halfway. Press the birdseed down to make sure that it is well packed. Place the bent end of the pipe cleaner into the mold on top of the coated birdseed. Fill the mold the rest of the way up, pressing down on the birdseed to make sure that it is firmly packed on top as well as on the bottom. Leave the birdseed in the mold to dry (we left them for about two hours). Pull the straight end of the pipe cleaner around and twist it, making a circle to hang the bird seed ornament. “Pop” the birdseed out of the mold; allow the ornaments to finish drying before you try and hang them (we left them overnight, just to be sure). You can use twine, but pipe cleaner can be twisted around tree branches, making it easier to retrieve them and dispose of them once the birds have eaten their treats! We did this activity with Pre-K to early elementary school aged children (SCRATCH) and with teenagers (Produce Pedalers). Kids of all ages enjoyed this activity! The SCRATCH Project will be selling these ornaments at the Winter Blues Farmers Market on Thursday, February 25, starting at 4 p.m. at the Charleston Civic Center. Ah, winter break – that time of year when teachers and students rejoice, and parents ask the question, “What am I going to do with these children for the next two weeks?” Here are some fun and budget-friendly activities you can do with your kids during the winter break, especially with the mild temperatures we’ve been having here in West Virginia so far this season. It’s been a snowless December for the most part, but get into the winter spirit by having an indoor snowball fight. You can buy indoor snowballs or shower poofs, found in the health and beauty section. Or, with this overly warm weather, you can still take the “fight” outside. If you’re itching to see snow on the ground, consider making your own. Using the following ingredients, mix one wet with one or more dry ingredients. Add glitter for a snow that looks more festive. Enjoy the unseasonably warm weather while it is here by going on a nature walk scavenger hunt. There are great walking trails all over the region, just check your state and local parks. Here’s a fun idea to try: If you take the walk with socks over your shoes, the socks will collect seeds. In the spring, plant your socks and see what grows! If you’re open to venturing a little farther than your own front yard, consider volunteering someplace as a family, like at a local homeless shelter, soup kitchen, community holiday dinner, or even the animal shelter. Have children go through toys and clothes and donate them locally. Or, join this college student and put jackets, scarves and mittens around a local city with notes that read, “I’m not lost! If you need me, please take me.” Organize an event such as a blanket and jacket handout. Or take the time to explore your local community by going to a museum, visiting an ice skating rink, or taking a class or workshop as a family. Find local events at West Virginia Department of Commerce’s Calendar of Events. Between at-home activities and volunteer opportunities, the are a plenty of ways to keep you and your kids busy all through the winter break.